A great set of emulations. They add colour, depth and punch but retain a great deal of finesse and detail. Plug-In Alliance has had a hand in some excellent emulations (Maag EQ and Vertigo VSC-2 Compressor to name but two) and the subtleties of the original Lindell Units must have proved to be a challenge, but one you would expect it to meet. First up is the 6X-500, a pre and EQ with high and low-pass filters. The pre is designed to be pushed, up to and beyond the point of breaking up, and this emulation does exactly that. Clean and transparent with the input low, as you push it the sound thickens and you can get a good bit of grit from it. The EQ is simple top and bottom but sounds very good, particularly the airy end of the HF, but it's the filters that are particularly special. The slopes go from 6dB to 36dB per octave and they are beautifully smooth even at their most radical. Next comes the 7X-500, which is a limiter modelled on the 1176. This is a great solid unit with a lot of 1176 character, although even with the 100:1 ratio you don't quite get the 'all in' sound of the original. That said, with the addition of the sidechain HPF it's very usable and has a pleasing touch of vintage colour. A good all-rounder. Then comes the PEX-500. The hardware version is a transistor emulation of a valve Pultec and so you can't expect it to be exactly like its inspiration, and the software version is no exception. We find the upper mid area to be a bit weak - we'd like it to have a bit more bite - but the smooth highs as you go up the frequencies more than make up for it. It has a lovely low-end too. It can add real warmth and depth. We had great results putting it over instrument busses for a bit of classic general Hi/Lo EQ. Channel X is a combination of these three units. It makes for a powerful channel strip with some excellent tone- shaping possibilities, enhanced by the ability to swap the order of the three into any position in the chain. Clever and more useful than you may imagine. Lastly comes the 254, which is an emulation of a particular favourite of ours, the Neve 2254. 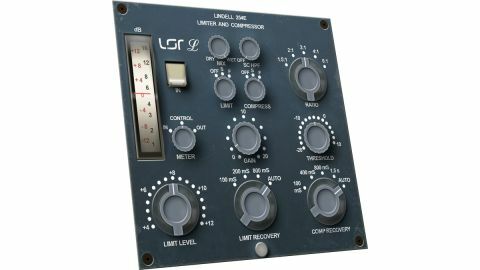 This is a classic and highly coloured compressor limiter which certainly has its place in the Rock 'n' Roll hall of fame. The limiter has plenty of poke to put some real punch into drums and '70s Rock bass wouldn't have sounded the same without it. The compressor is great on pretty much anything, although for us it's always a big favourite on clean (ish) guitars as it holds them beautifully and adds weight and colour. We have tried all of the original units and we must say that the emulations really do them justice. They add colour and character and, with the addition of the 254, a lot of punch. We will certainly be reaching for them in the future.